by John R. Vile, Lanham, MD: Rowman & Littlefield Publishers, Inc., 2012. 265pp. Cloth $34.99. ISBN: 9781442217706. Reviewed by Craig Hanyan, Prof. Emeritus, Department of History, Brock University, St. Catharines, Ontario. John R. Vile has been encyclopedic. He has provided an encyclopedia of The Constitutional Convention of 1787: A Comprehensive Encyclopedia of America’s Founding (2005). His other reference collections deal with the amendments to the fundamental law, with Supreme Court decisions, and with American legal and political figures. This relatively short book centers on an abridgement of the recorded debates that took place in that secret summer gathering of 1787. He hopes to “encourage lay persons, high school students, or college and university students to read straight through” (p.ix). Reading, they encounter the substance of the struggle to forge a working government and the reasoning that the delegates employed to persuade their fellow constitutional architects. Noting the much republished digest of leading Supreme Court decisions to which he contributed (Menez and Vile 2004), Vile explains that, like “a ‘brief’ of the convention’s deliberations[,] … this book explains key facts leading up to and surrounding the convention, identifies the issues that the delegates faced, records the decisions that they reached, and sometimes reconsidered, and presents the arguments that the proponents and opponents of each decision offered” (p.x). He expects that working their way through these much condensed exchanges will enable “students and other citizens” (p.xi) to understand why the Constitution says what it says. Vile also expects readers will comprehend that the framers of the Constitution eschewed “the utopian quests that have too often dominated modern politics” and instead sought “practical” solutions that drew on their experience with state politics (p.xii). In this vein he echoes James Madison and Alexander Hamilton in “The Federalist No. 20”: “experience is the oracle of truth” (Cooke 1961, p.128). Still, the founders’ reference to “a more perfect union” points to an Enlightenment vision ever struggling toward an ideal republic, as Jack Rakove suggested in his Foreword to Vile’s Comprehensive Encyclopedia on the Convention (p.xxix). The arrangement of the volume requires attention. A nineteen-page index, centering on the contribution of individual delegates, is preceded by a thirteen-page selected bibliography designed to guide students into the literature on the origins of the Constitution and more generally into the era of the “founding fathers.” Each chapter includes a list of sources cited. References in the text, however, are usually confined to Max Farrand’s Records of the Federal Convention of 1787 (1966). Combing through the bibliography, assiduous readers may move beyond Farrand to Thurston Greene’s The Language of the [*556] Constitution (1991) and The Founders’ Constitution (1987) of Philip B. Kurland and Ralph Lerner, both offering documents that illustrate the historical contexts of the Constitution’s language. Other aids frame the dialog in the Convention. A brief “Timeline of Events,” runs from 1215 to the first publication of Madison’s notes in 1840. There follows a useful “Day-by-Day Timeline of the Constitutional Convention, 1787.” This ten-page listing points the reader to the major events of each day. It does not, however, guide the reader to the relevant pages of the text, and in those pages, the reader must carefully scan to discern the dates during which the discussion took place. Next, the brief first chapter, “Revolution and Its Aftermath,” leads the reader into the Convention. This chapter focuses on the growing alienation from British authority and on the structure and function of the confederacy that accomplished the Revolution. The social and economic discontents that later fed into the Anti-Federalist ethos are not laid out at length. In the section entitled “Shay’s Rebellion” Vile remarks that “members of an elite can be relatively unaware of the sufferings and discontents of the lower classes” and “contrariwise, elites – especially those who interact with foreign nations and diplomats – are often aware of problems that are of little concern to the lower classes” (p.13). So Robert Morris merely appears as the well-connected speculator who nominated Washington as presiding officer of the Convention (pp.23, 28). He is not the egregiously predatory plunger portrayed elsewhere (Bouton 2007, passim). The seventh and last chapter presents a brief outline of the process of ratification and adoption of the Bill of Rights. One paragraph (p.172) summarizes the range of views that informed Anti-federalist opposition to the ratification of the Constitution. Given the proposition that “the spirit of American politics has … often been inspired by the Anti-Federalists” (Cornell 1999, p.1), a fuller exposition of those views would serve to better inform the general reader. In his second chapter Vile profiles the delegates. There he emphasizes sectional differences and concerns, explores the organization of the Convention, and introduces the Virginia Plan. The Virginia Plan and the competing New Jersey Plan are among the “Selected Documents” that follow the narrative presentation of the Conventions proceedings. Some readers will want to compare this National Archives version of the Virginia Plan – later surrendered to Secretary of State Timothy Pickering by George Washington (1796) – with the comments in Farrand’s Records (1966, III: 593-4) and the three versions offered in Documents Illustrative of the Formation of the Union of the American States (Tansill 1927, pp.952-993). Other documents have been selected for the general reader: the Declaration of Independence, the Articles of Confederation, and the Constitution of the United States, with its Amendments to 1992. Finally, there is, inevitably, Madison’s Federalist No. 10. A comparatively complex presentation such as Madison’s Federalist No. 39 might more aptly echo the conflicts in the Philadelphia meeting. In No. 39 Madison struggled to deny the threat of an anomalous imperium in [*557] imperio on the one hand and “consolidation” on the other. Rather, in Federalist No. 10, Madison centered on the comforting argument that “the greater number of citizens and extent of territory which may be brought within the compass of republican … government … renders factions combinations less to be dreaded …” (Cooke 1961, p.228). Critics of The Writing and Ratification might prefer the inclusion of still other numbers from that 1788 series – numbers that dealt with the threat of rebellion and disorder, with the power to tax, with the need for greater unity in the face of foreign powers, and with the fear that clashing combinations of the states might otherwise take shape to bring wars among them. To repeat, those critics might also wish to see selections of the competing polemic literature that reflected the minds of the opponents of the Constitution. Those opponents included delegate Elbridge Gerry, whose views have been deemed representative (Cornell 1999, pp.27-31), although the particular objections of Anti-federalists may have, overall, “fanned out along a spectrum” (Maier 2010, p.93). Eschewing such distention, however, Vile directs his readers through major steps toward the dominant outcome. The essential question about the book remains: how well did Vile perform the difficult task of reducing the recorded exchanges of the Convention into a brief and lucid dialog that catches the gist of the sometimes extended and sometimes obscure words of the delegates? The six chapters following “The Revolution and Its Aftermath” strive to present the debates and procedures leading to the chapter on “Wrapping Up Business, Signing, and Ratifying.” Each of these chapters is in turn broken into subsections, presented with clear headings in capitals designed to give the reader the steps taken and the nature of the discussion took place. Generally, Vile deftly reduces the discussion in the Convention. Precision and nuance of meaning, however, prove very difficult to capture, as a few cases illustrate. On July 5, the Convention heard Gerry’s committee report from which Madison noted: “I. that in the 1st branch of the Legislature … States … be allowed 1 member for every 40,000 inhabitants … that each State not containing that number be allowed 1 member: that all bills for raising or appropriating money… shall originate in the 1st branch … and shall not be altered or amended by the 2d branch: … II. that in the 2d branch each State shall have an equal vote” (Farrand 1966, I: 526). The Writing and Ratification records that “Madison focused in on what he regarded to be the ineffectiveness of limiting the origin of money bills to the House. The convention should instead focus on pursuing a system of representation that was just. The convention should not pursue harmony over justice” (p.83). The reference to “harmony” lacks precision. Madison did record himself as regarding “the exclusive privilege of originating money bills … had no effect,” but he also held that experience demonstrated that “both in G. B. and the States having a similar regulation that it was a source of frequent & obstinate altercations” (Farrand 1966, I: 527). More important, Madison felt that, if the convention rejected representation by states as states in the second branch, “the Convention with justice & majority of people on their side, had nothing to fear” (Farrand [*558] 1966, I: 528). National harmony, not mere harmony in the convention, would come were the delegates to endorse the Virginia Plan principle that the “Legislature ought to be proportioned to the Quotas of contribution, or to the number of free inhabitants …” (Farrand 1966, I: 20). Madison had raised the question of representation at the outset of the convention, and continued to challenge the advocates of equal votes for the states. Madison’s words meant that he still held firmly to his theory of faction. He still sought somehow “to reduce the states to mere subdivisions of the centralized structure” (Gutzman 2012, p.67). Vile reports that, before, on June 30, Madison had held that “the central division within the states was not between the small states and the large ones but between those of the North and the South. If there were to be a compromise relative to representation, it should represent states according to free inhabitants in one branch and by counting slaves as three-fifths a person in the other!” (p.80). Madison himself recorded that “as he reflected in this divergence of interest, “he had been casting about in his mind for some expedient that would answer the purpose” of driving home the difference between states because of “having and not having slaves.” Nevertheless, “he had been restrained from proposing this expedient” because of “his unwillingness to urge … diversity of interests” and because “the inequality of powers … vested in the two branches … wd. destroy the equilibrium of interests” (Farrand 1966, I: 486-487). The original source demands that we carefully contemplate Madison’s objectives as well as his wording. As Jack Rakove has pointed out, “by calling attention to fundamental differences between the states and even regions, it gave new legitimacy to the argument for ‘security’ by encouraging every delegation to ask how its constituents might be protected if the balance of power within Congress swung against their particular interests” (Rakove 1996, p.69). Madison’s essentially tentative and probative proposal reflected both his tactical purposes and his tenacious hope for the nation. At times, not often, Vile’s wording makes the reader pause and puzzle. Referring to Madison’s 6 June comments on the executive and the proposed council of revision, Vile draws on Farrand (1966, I: 138) to report “Madison argued that allying the executive with members of the executive might actually defend both institutions against ‘Legislative encroachments’” (p.41). It would be clearer to say that Madison was speaking of “an association” with judges in a council of revision – an arrangement rather like that of New York State under its 1777 Constitution (Adams 2001, p.266). Occasional problems such as these bring to mind James H. Hutson’s observation that “Madison's notes are not a forgery, but they are far from a verbatim record of what was said in the Convention. They omit much of what happened in Philadelphia. The extent of their omission is the measure of the difficulty in using them to discover the delegates' intentions” (1986, p.36). Vile tells us “the framers of the U. S. Constitution engaged in a long-term reasoned discussion” (p.x). True, nevertheless the intended readers of The Writing and Ratification should be made aware that they have before them a digest of a [*559] digest. This reviewer considers the above criticisms to be of limited weight given the value of this slim book. Many students and general readers will find it a useful introduction to the Convention debates and the extensive literature that deals with the initial shaping of the government of the United States. The book may lead readers to understand why, after the Convention, Madison urged Americans to understand “that a faultless plan was not to be expected” and why “the Convention must have been compelled to sacrifice theoretical propriety to the force of extraneous considerations” as political and regional pressures led the delegates to forge compromises into a fundamental law (Cooke 1966, pp.232, 237). The compressed discussions in Vile’s book outline the delegates’ struggle toward a practical solution, a solution with which they could live. To the heirs of their creation remains the burden of its virtuous implementation if not its final, lucid exposition. Virtue was not complete in its creation as an instrument; that virtue can only be realized in the ongoing and just implementation of the fundamental law. Adams, Willi Paul. 2001. The First American Constitutions: Republican Ideology and the Making of the State Constitutions in the Revolutionary Era. Lanham, MD: Rowman & Littlefield. Bouton, Terry. 2007. Taming Democracy: “the People,” the Founders, and the Troubling End of the American Revolution. New York: Oxford University Press. Cornell, Saul. 1999. The Other Founders: Anti-Federalism & the Dissenting Tradition in America, 1788-1828. Chapel Hill, NC: The University of North Carolina Press. Farrand, Max, ed. 1966. The Records of the Federal Convention of 1787. 4 Vols. New Haven, CT: Yale University Press. Gutzman, Kevin R. C. 2012. James Madison and the Making of America. New York: St. Martin’s Press. Greene, Thurston, ed. 1991. The Language of the Constitution: A Sourcebook and Guide to the Ideas, Terms and Vocabulary used by the Framers of the United States Constitution. Westport, CT: Greenwood Press. Hutson, James H. 1986. “Creation of the Constitution: The Integrity of the Documentary Record.” Texas Law Review. 65 (1): 36. Kurland, Philip B. and Lerner, Ralph. 1987. The Founders’ Constitution. 5 Vols. Chicago: University of Chicago Press. Maier, Pauline. 2010. 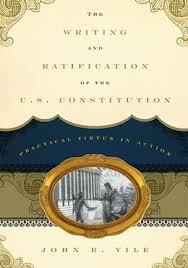 Ratification: The People Debate the Constitution. New York: Simon & Schuster. Menez, Joseph F. and Vile, John R. [*560] 2004. Essential Supreme Court Decisions: Summaries of Leading Cases in U. S. Constitutional Law. 15th edition. Lanham, MD: Rowman & Littlefield Publishers. Randolph, Edmund, 1796. THE VIRGINIA PLAN AS AMENDED. National Archives Microfilm Publication M866, 1 roll. The Official Records of the Constitutional Convention, Records of the Continental and Confederation Congresses and the Constitutional Convention, 1774-1789, Record Group 360. Washington: National Archives. Tansill, Charles C. comp. 1927. Documents Illustrative of the Formation of the Union of the American States. 1927. 69th Congress, 1st Session. House Document No. 398. Washington: Government Printing Office. Vile, John R. 2005. The Constitutional Convention of 1787: A Comprehensive Encyclopedia of America’s Founding. Santa Barbara, CA: ABC CLIO. Copyright 2012 by the Author, Craig Hanyan.